Presented as part of our Latin American Film Series celebrating Hispanic Heritage Month, with an OPENING RECEPTION at 6:30p on Thursday, October 11th, featuring catering by Cali-N-Titos and The National; live music by Beto Mendoza, SalsAthens dancers, and a visual art exhibit by local ULead Athens student artists. 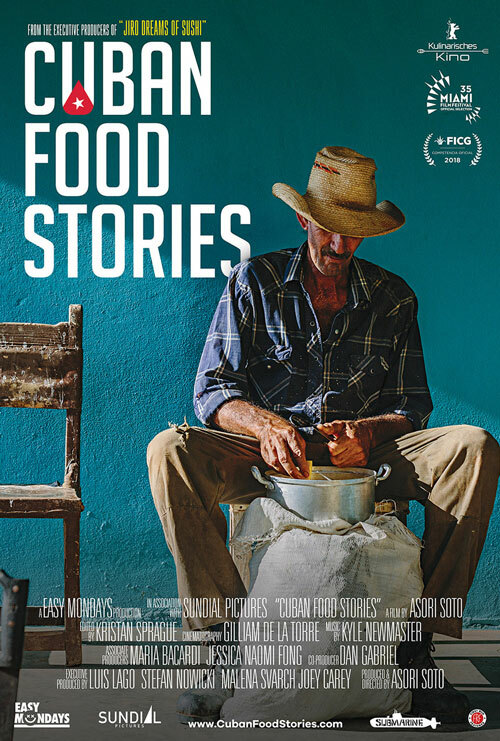 From the Executive Producers of JIRO DREAMS OF SUSHI comes this unique film about food, society and culture on the island of Cuba. After a decade living in the United States, Asori Soto returns to his homeland of Cuba to search for the missing flavors of his childhood -- a journey to discover culinary traditions long thought lost due to the hardship that Cuba survived after the collapse of the Soviet Union. Through nine stories, Soto explores the present culinary landscape of his homeland and provides a glimpse into what the future may hold. It is a personal road trip adventure all around the island to discover the most authentic tales behind the Cuban cuisine. With unprecedented access to regions so remote that one can only arrive by raft, horseback, or swimming, Soto's journey will leave your mouth watering as he travels from the middle of nowhere to the bustling cities to rediscover the culinary roots of an exciting Cuba in a time of change. GUEST SPEAKER -- THURSDAY OCTOBER 11 @ 7:30p: Introduction by Dr. Melissa Perez Rhym, an Academic Support Specialist at Cedar Shoals High School and co-director of ULead Athens, a non-profit organization that works with immigrant and first generation Latinx students to continue their post-secondary education. The daughter of Cuban immigrants, Melissa was raised in Miami, FL. and has lived in Athens, GA for the last 15 years.